Wondering what to do with the last bit of herbs from your garden? Luckily there are some creative ways to store and preserve these fragrant gems into the winter months. Of course you could dry them out and crush them for teas or a dried powdered version or better yet why not submerge them in some extra virgin olive oil! This technique is called an infusion – as you are basically infusing the herb with the oil and it’s precious oils disperse in the base of olive oil. What you are left with is deliciously intense fragrant oil that can be used for anything from marinades, to sauces or even salad dressings. Choosing from herbs such as thyme, rosemary, oregano, basil or parsley these are some great ones to start with. 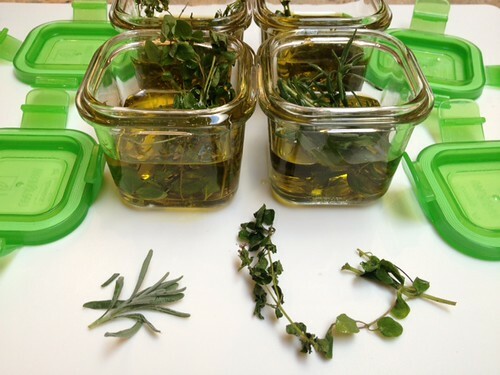 – Place individual herbs in a glass container or do combinations of two or more herbs for even more flavour. – Allow to “infuse” for 24-48 hours. Then use right away or freeze for use later in a delicious recipe! This entry was written by Melissa, posted on November 13, 2012 at 1:02 pm, filed under Wean Team. Bookmark the permalink. Follow any comments here with the RSS feed for this post. Both comments and trackbacks are currently closed.